i woke up this morning thinking i had conjunctivitis. my right eye was completely bloodshot, which is no surprise, since last night i rubbed the hell out of it because it was itchy. i squeezed in a few drops of visine and took my shower. when i got out and looked at myself in the foggy mirror, my right eye was completely healed, as a matter of fact it was whiter than my other normal eye. i got dressed and went back into the bathroom, where in that short period of time, my eye once again reverted back to red. i didn't have time to worry about it and went out the door. i was heading down to the financial district to meet john again regarding an additional payment to my refinance closing, a big chunk of leftover interest accrued that never got paid (and guess who had to pay it all before my previous lender will relinquish my deed?). "it is what it is," john lamented over the phone last night. after he explained the numbers to me, i wrote out a check and left the building, poorer yes, but glad it's finally over. next stop was the squid office, where i had to make a projector for a delivery. since there was no hurry for me to be there (they didn't even know i was coming), i wandered around the financial district a little bit, revisiting some old landmarks. 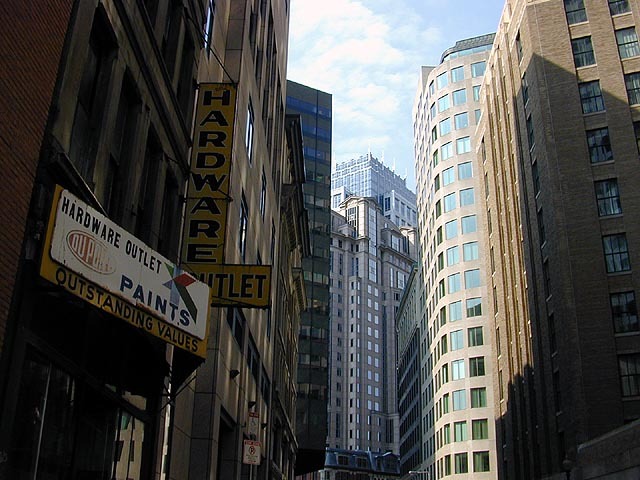 the screen house office at 103 broad street was the best office space ever in terms of prime location, close to downtown crossing, faneuil hall, north end, and chinatown. at the squid office, only alex and kristine were there. i made my fixes then created a working projector. i had an opportunity to go into the bathroom and check the status of my eye, which was fine, it wasn't conjunctivitis after all. alex and kristine were going out for a run, i really wanted to join them, but i didn't have my clothes ("you can just meet us along the charles!" kristine suggested) and i still had some other work to do. i left to go back home, more programming waiting for me back in cambridge. i went to mei tung supermarket to buy some groceries before taking the subway from south station. 15 minutes and back at porter square, i bought a bouquet of irises from the station florist ($3), then went across the street to brueger's bagel to get a salmon sandwich ($5), figured i deserved to treat myself to a nice lunch instead of trying to make something. walking home, i wondered if people were curious to see a guy carrying flowers. i've always wondered if people are thinking, "hmmm, who's the lucky girl?" 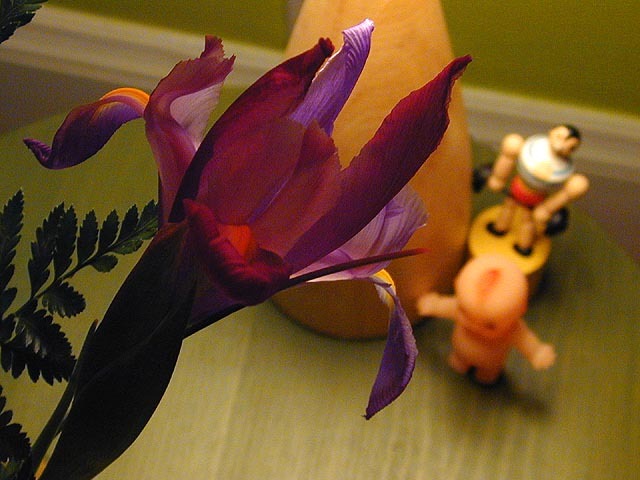 there's an implied romantic gesture whenever you see a guy with flowers. unfortunately for me that's not the case, unless you're counting renata, who was coming over later in the evening. i bumped into bruce who was outside looking through his mailbox, we shared our weekend plans, then each going back to his respective house. i wrote the client an e-mail informing them i'd have to push back the self-imposed deadline to monday since there was still a lot of coding yet to be finished. with that out of the way, i changed clothes and went out for a run. another day where it felt like i was running downhill. i feel like if i wanted to, i can overtake anyone else running out along the charles. i think i run fast, but i know i can run even faster. maybe my eventual goal is to sprint 3 miles? andrew stopped by briefly to pick up his mail, including one from his company letting him know how much of an annual raise he'd be getting. after he left, renata called me to ask when she should come over. "anytime is good," i said, "even now." she told me she'd be right over, but two hours later after the sun had already set (and after julie had confessed to me over instant message that she was addicted to ebay) was when she finally showed up at my door. i didn't ask any questions, she offered no explanation. i quickly ran across the street to star market to pick up some cooking ingredients, setting the egg timer to 5 minutes. i got back to the house just as the timer started ringing. 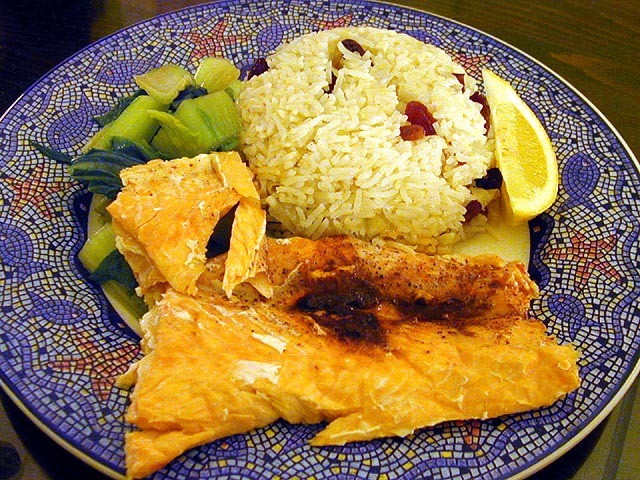 tonight's menu: toaster oven baked salmon flavored with olive oil, salt, ground pepper, and a special chinese "ma-la" (numbingly hot) paste, served with a raisin pilaf and a side of steamed bok choi (that renata brought). it was my first time making fish, since i don't have a strong fondness for food from the sea. i started off by preparing the salmon, flavoring them then rolling everything up in tin foil to be heated at 400 degrees for 20 minutes in the toaster oven (it just barely fit inside). renata helped me chop the onions, which was so pungent it made her cry, and when was tenderizing the chopped onion inside of the pot over the stove, the fumes made me tear up as well. we had dinner in the living room, benny & joon (1993) on the television, a movie that renata seemed to be captivated by (i was just captivated by the fact that she liked this movie, which i thought was kind of hokey). during commercial breaks i'd switch over to the red sox yankees game (which renata had zero interest in), pedro finally taking a victory away from the yankees. the salmon was so spicy hot it made renata's ears tingle. for dessert i sliced up some fruits, some chinese guava (at least i think they're chinese guava, they're called "ba-la" in taiwan) and some canteloupe. renata was fascinated by the "guava" which she never had before, and reminded her of the taste of flowers. she also really loved the canteloupe, super sweet since it was probably over-ripened, until she ate one that tasted "moldy". renata wanted me to find her a song (on the internet) by the dixie chicks called "traveling soldier" which she heard while she was in yellowstone. i played her my new favorite song, "give it up" by kc and the sunshine band. "that's so cheesy," she said, as soon as she heard it. "how dare you judge my music!" i accused her, as if her song was any better. she then went on a search for a few other songs, while browsing and listening to my small playlist (a lot of songs were removed to make more room). we crowded the couch, me winching anytime she played one of my more embarassing recently downloaded tunes. we discovered that she really likes manu chao's "bongo bong" song. after i told her my morning conjunctivitis scare, she told me she and her brother used to get pink eye all the time, and even now she still gets it, most likely contracted from the children under her care. we then accused each other of giving one another pink eye. and throughout the evening, anytime a photo was snapped, she'd beckon for the camera with outstretched hand, so she could approve of the photos (let's just say shouts of "erase it!" was heard more than once tonight). "i don't want you to take any bad photos of me," she implored. bad photos of renata? never! still, she giggled when she finally discovered how to erase photos from the camera, something i never taught her because i was afraid she'd erase the whole memory card if only if she knew how. my days of taking candid renata photos are numbered. towards 11pm renata started to get drowsy, and decided she ought to go home before she passed out on the couch. evening ending pleasantries were exchanged as she left the house, the dark night feeling cold, summer soon drawing to a close. later in the evening i gave laurie a call all the way out in portland, oregon, her new home, after she sent out an e-mail to everyone with her new phone numbers. i really want to milk this free long distance package to anywhere in the 50 states! she was still unpacking, we talked briefly (12 minutes), before she had to go back to her boxes. dan also instant messaged me from brazil, back from his bahia honeymoon, days away from returning to boston, where i filled him in on all the latest local sports news.